I spend a lot of time researching the working lives of women and the importance of public policy in shaping their decisions and well-being. I study historical changes in women’s work and family dynamics, retirement income policies, child benefits, and the structure of the tax system, from a feminist perspective. How can we design policy to efficiently support Canadians and support gender equality? Recently, I’ve taken to re-examining the gender wage gap. While Canadians made substantial progress toward gender equality over the past few decades, women continue to be paid wages much less than men and it appears only a small part of the gender wage gap can be explained by the experience and skills that men and women bring to the labour market. Large parts of the gender wage gap relate to the fact that men and women tend to segregate into different types of occupations. This type of occupational segregation has not changed in several decades, which I find rather astounding. I now spend my time trying to better understand the nature and source of this segregation of men and women into different jobs. Policy makers may be interested in achieving gender equality, but we need to better understand the sources of inequality before we can design effective policy. 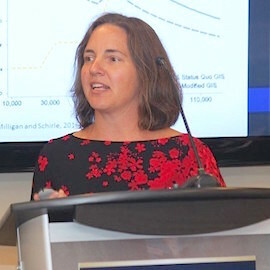 Tammy Shirle is director of the Laurier Centre for Economic Research and Policy Analysis.